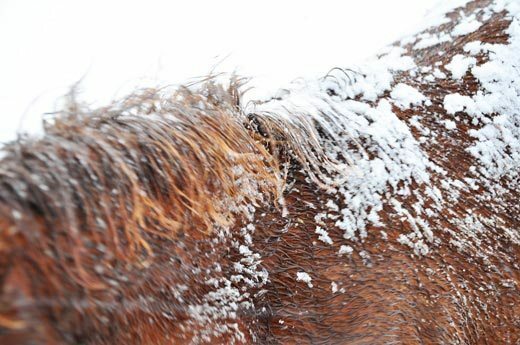 In light of the fact it looks like another cold snap is working its way across the prairies again, I thought it might be helpful to post the following tips for horse care in winter. They may be redundant but it never hurts to have a refresher course, part way through the season. 1. Winter tends to be a time when horses lose weight, and a heavy winter coat can hide a thin horse. Make sure to check your horse's body condition every 30 days. This means putting your hands on your horse's body and feeling around for fat deposits or a lack thereof. 2. Horses require additional energy from their diet to maintain body weight when temperatures drop below -20 degrees Celsius. Remember that pasture grasses do not grow during the colder months – and digging through snow to try and get at any left over grasses from the summer uses up the horse's precious energy stores. Providing good quality hay at 2% of the horse's body weight should meet his nutrient requirements for maintenance. Feeding hay also generates heat during digestion by gut microbes, and that helps horses stay warm. 4. 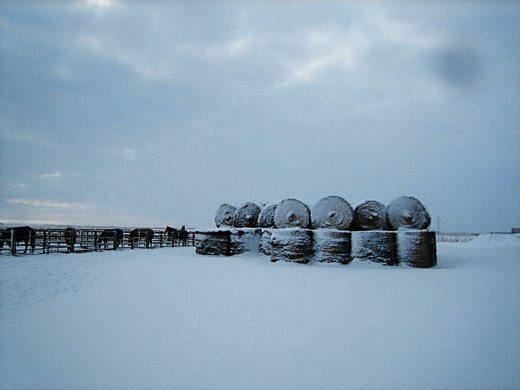 Use hay feeders during the winter. Up to 20% of hay is wasted by horses when fed on the ground. 5. Consider adding fat to the diet in the form of oil or bran in order to increase the amount of energy in the diet. Fat packs more energy in each pound than carbohydrates. 6. Improve how your horse utilizes the feed you give him during winter by having their teeth checked and floated if necessary and by deworming the horse prior to the winter months. 7. Horses might decrease their consumption of cold or freezing water during the winter leading to an increased risk of colic. Make sure your horse is consuming at least 10 gallons of fresh clean water each day. Use tub and/or bucket heaters to help reduce ice formation and to keep the water lukewarm. Check all water sources and remove ice daily. 8. 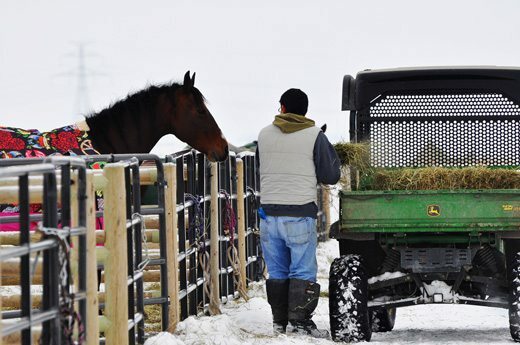 Horses in work or pregnant mares might require grain along with hay to maintain body weight. Avoid feeding large amounts of grain in one meal feeding in order to reduce the horse's risk of colic. 9. Provide salt blocks in fields and stalls. Although salt intake is more important during the hot summer months to replace sodium and chloride lost in sweat, horses do not meet their daily salt requirements by consuming forage alone. 10. 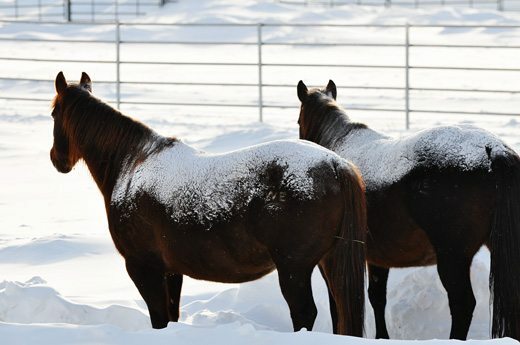 Keep in mind that older horses have additional needs during the winter. Feeding a diet based on beet pulp prior to and during winter can help them maintain their weight during the winter. 11. 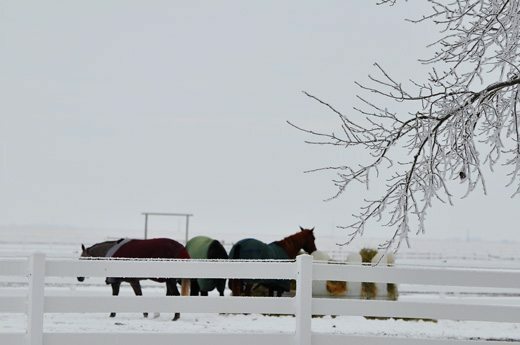 Be mindful of your horse's temperature after a workout in the winter. 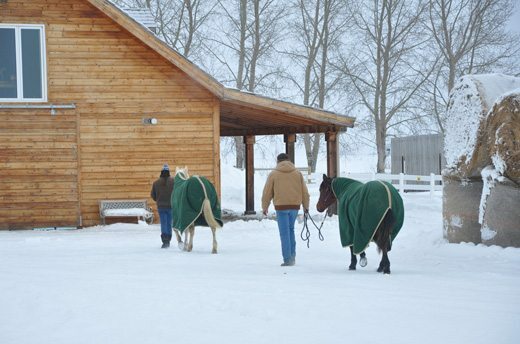 If you must move the horse outside once it has become sweaty and heated, the horse will first need time to cool out and likely a fleece cooler to help prevent a chill from coming on – especially as you step outside. The longer hair coat your horse has, the longer he will need to cool out properly. I am caring for a “Mini”, and my greatest source of concern is she will not drink water. I have a small trough with a heater so the water is not cold. I have tried adding sugar to the water, no effect. What other means can I use to get this little horse to drink? Sometimes a little loose salt added to a horses hay will induce them to drink. Try adding a little loose salt ot her grain ration each day. I’ve had luck with apple cider vinegar or even apple juice added to their water….